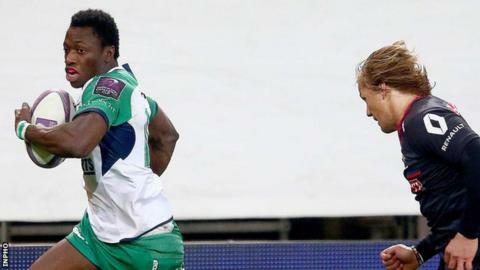 Connacht lost a 19-3 lead as Grenoble won a thrilling European Challenge Cup quarter-final in France. Two Niyi Adeolokun scores and a Robbie Henshaw try seemed to put Connacht in control but Jonathan Wisniewski replied with 13 points before the break. A Matt Healy try left Connacht 26-16 up before Grenoble punished Denis Buckley's sin-binning as Lucas Dupont and Mahamadou Diaby scored tries. John Cooney kicked Connacht ahead again but Wisniewski's late drop goal won it. Grenoble's victory means they will face Harlequins in the semi-finals while Connacht will have to recover from this disappointment to regroup for the conclusion of the Pro12, in which they are currently placed second in the table. As Connacht started with their verve that has been the hallmark of their season, centre Bundee Aki's looping pass set up Adeolokun's 13th-minute try. After Wisniewski's penalty reply, a lightning Healy break and well-directed Shane O'Leary cross-kick allowed Henshaw to touch down before a Kieran Marmion dart helped set up Adeolokun's second try. However after slotting his second successful conversion, O'Leary's reckless cross-kick on his own line gifted Grenoble a lifeline as fly-half Wisniewski replied. Two more Wisniewski penalties reduced Connacht's lead to 19-16 at the break but the Irish province moved 13 clear by the 52nd minute after the outstanding Healy burst through the Grenoble defence and O'Leary kicked five further points. However, Buckley's sin-binning on the hour mark, after he illegally attempted to prevent a Grenoble try, was a key moment. Grenoble, currently eighth in the Top 14 table, scored two tries during Buckley's absence with Dupont and Diaby touching down as Irishman Chris Farrell provided a brilliant off-load in the build-up to the second score. Wisniewski's two conversions helped Grenoble lead for the first time with 10 minutes left and while replacement John Cooney's penalty put Connacht ahead again on 73, the home number 10's drop goal two minutes later clinched victory. Grenoble: G Aplon; N Nemani, C Farrell, N Hunt, L Dupont; J Wisniewski, C McLeod; S Taumalolo, L Jammes, D Edwards; B Hand (capt), P Kimlin; S Setephano, M Diaby, R Grice. Replacements: F Barcella for Taumalolo 53, M Marie for Hand 70, F Alexandre for Grice 26, F Estebanez for Hunt 67. Connacht: M Healy; N Adeolokun, R Henshaw, B Aki, D Poolman; S O'Leary, K Marmion; D Buckley, T McCartney, F Bealham; U Dillane, A Browne; S O'Brien, J Connolly, J Muldoon (capt). Replacements: D Heffernan for McCartney 71, R Loughney for Connolly 60, JP Cooney for Bealham 75, Q Roux for Dillane 60, G Naoupu for O'Brien 73, J Cooney for Marmion 63, P Robb for O'Leary 66, F Carr for Poolman 37.